While the 2007 Vuelta a España was riding into its third and final week, the New England cyclo cross scene was awaking from its long summer slumber. New England is one of the hot-beds of the US cyclo-cross scene and Stu Thorne is one of the primary ‘movers and shakers' of this dynamic sport. Last year we interviewed Stu and you can find his view on what is described by industry insiders as ‘the fastest growing cycle racing discipline in the world'. While these teams only comprise three riders they represent a power house of cyclo-cross talent and achievement. Lyne Bessette and Jeremy Powers will carry the Cyclocrossworld.com Team colors and Tim Johnson will carry the Cannondale-Leer- Cyclocrossworld.com team colors. The annual cross-over from the road season to the cyclo-cross season has already started. The first cyclo-cross race was contested this past week. For the road fans there are still the World Championships at the end of September, the Paris-Tours classic (Oct 14th ) and the great “Race of the Falling Leaves” classic, Giro di Lombardia on October 20th . Stu Thorne hosted the formal team introduction on September 18 th at the Project Adventure Moraine Farm Conference Center in Beverly , Massachusetts . Liberal helpings of food and drink added to the pleasure of about 70 invited people who came to meet the riders, see the bikes and generally discuss the upcoming cross season. “Winning the award for traveling the furthest” was David Alvarez from Ridley Bikes who had flown in from Belgium . Another guest making a long trip to the event was Alex Wassman from SRAM. His SRAM colleague Merlyn Townley who, as one of their mechanics ‘gets things done', gave me an interesting bit of cross trivia. The UCI has recognized his ‘neutral service' as the first of its kind in the sport. Merlyn introduced the concept in October 1991 in Lynn Woods ( Massachusetts ) which had a notoriously grizzly cyclo-cross course. That year Merlyn provided his services to about 12 cross races and after that each year has seen him at up to 25 events per year. Mountain Bike races see Merlyn keep his neutral support services razor sharp during the summer. From a business point of view Merlyn soon learnt that neutral service was a great way to showcase products in ‘real life' conditions in a sport exhibiting consistent and dynamic growth. For the Cyclocrossworld.com riders the 2007/2008 cross season will kick off at the inaugural ‘Cross Vegas' at the upcoming bike trade show in Las Vegas . After that they embark on an odyssey traveling back and forth across the country participating in all of the US Gran Prix of Cyclocross in Louisville (KY), Portland (OR) and Princeton (NJ). Other key races include those in Boulder (CO) and the venerable Gloucester (Massachusetts) cross races on October 13 th and 14 th which always brings out hordes of fans to cheer on their home town heroes as well as riders from across the US and Europe. New for Stu's teams this year will be a foray into the European cross scene. His riders will be based in cyclo cross crazy Belgium for the month of January where they will contest the remaining World Cup events. For the ‘grand finale' they will be riding the World Cyclo Cross Championships in Treviso , Italy . Two-time Olympian, three-time Canadian National Cyclocross champion, multi-time road and time trial National champion, Gold medalist in the Commonwealth games. Canadian Cyclist of the Year , North American Cyclist of the Year and Cyclo-Cross Woman of the Year in North America. All this in one year 2001. USGP of Cyclocross Champion. Winner of the French World Cup – the only North American to ever win a Cyclocross world cup. You name it she has won it. Lyne races with such determination and drive. She is a joy to watch. Lyne has been a part of the Cyclocrossworld.com team since the beginning and I feel honored to work with her for another exciting season of racing. “I was on the phone the other day doing an interview and was asked how long have you been working with Tim. I had to think about it. The first thought was ‘too long', but after thinking for bit I realized that I have known Tim now since his junior days and I have actually been working with him for the last 12 years.” Tim has won at every level the sport has to offer. The Junior National Champs, Espoir/U23 champs and the Elite Nat Champs. As a U23 he was the bronze medalist at the 1999 World Championship in Poprad Slovakia (the first American to ever medal at the cross World's). He is a factor in every race that he enters and never have I seen him quit a race. I can't wait to get started on another season with Cannondale-Leer- Cyclocrossworld.com rider Tim J. “I first met Jeremy at the World Championships in Tabor Czech Republic. He had made the team as a junior that year and pleased the crazed Czech crowd with his bunny- hopping the barriers in 20 degree weather on a snowy, icy course. Incredible. He made the Worlds team again in 2004 in Pont Chateau France and I got to know Jeremy a bit more. I have always been impressed by his skill and determination. He competed for a few years in Europe battling it out with the world's best riders and then returned to the US for a full season of domestic racing and landed on the podium at a number of US Gran Prix. I am very excited to have Jeremy under the Cyclocrossworld.com tent this season. * Cannondale-Leer-cyclocrossworld.com Team Bike as used by Tim Johnson. 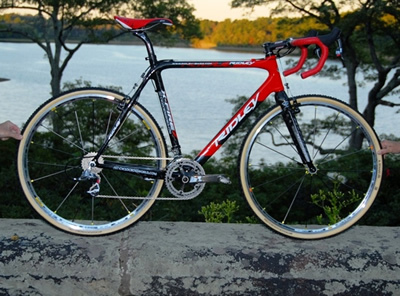 * Ridley X-night Cyclocrossworld.com as used by Lyne Bessette and Jeremy Powers. Visit www.cyclocrossworld.com/ for a wealth of information on everything cyclo cross as well as details on the team equipment.